Note: The final working version is here, the rest of this is entertainment. Don't try this at home (or anywhere else). I had determined to make nine board sections and combine them together after making the nine, each of these would contain nine equilateral trinagles, for a total of 81 triangles on the board. The Final Reflection made mention of a very nice set with inlaid brass on a black board, so I placed a separation around each of the individual triangles to provide a space for the inlay to be added later. 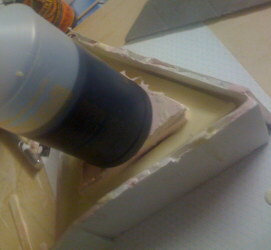 Armed with a computer printout of my masterpiece, I built a border around the printer output to hold the plastic resin while it set, used clay to mold where the inlay would go, calculated the amount of resin and catalyst I'd need, and poured 3 ounces of resin into a cup (one ounce at a time), then poured the same amount of catalyst into the same cup (one ounce at a time). 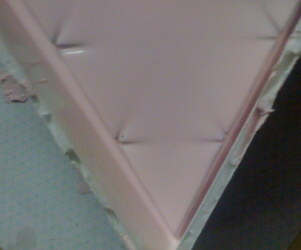 The resin actually hardened before I could get it spread out (it was getting pretty thick before I even got to pour it)! 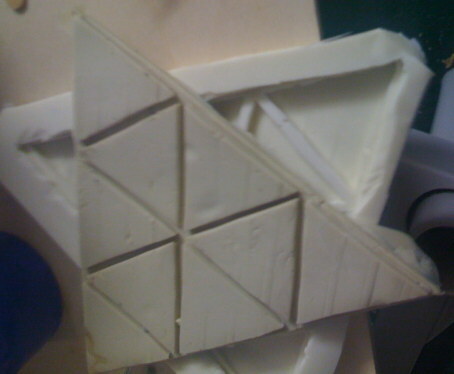 The gaps weren't consistent, when you're designing something that is a geometric model, consistency is a good thing. 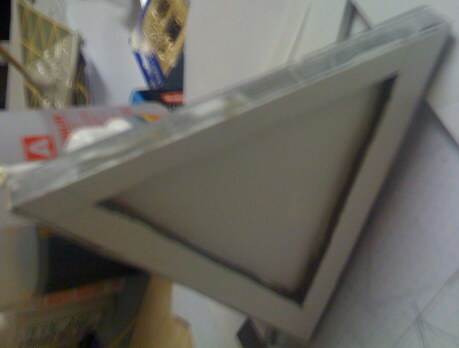 The board after removing it from the mold. The gaps aren't consistent, and the texture isn't smooth, but it's better than the first one. This shows the border I made to thicken the edges of the board section. The odds of the bubble (we'll call him Lloyd) getting out to his friends is slim, but he's going to try (he is an airhead, after all...). He doesn't make it, but he does manage to ruin the mold. See how CLOSE to the top of the mold the board section is? Lloyd is just below it, laughing at me. Lloyd the air bubble tries to escape. 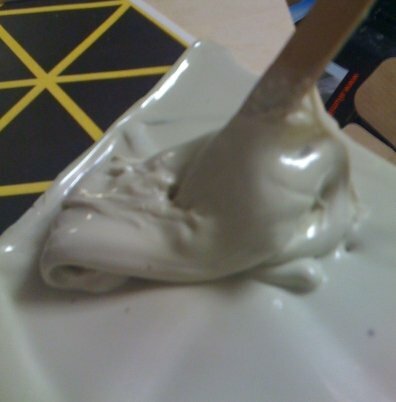 With this lesson, I should be able to get a decent mold this time. So I pour the bottom first. After pouring enough to cover the board section, I put a big chunk I cut out of the failed mold in (recycling saves money). Just to be safe, I put a weight on top of the mold. 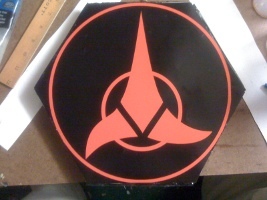 I only need the resin to make a filler, I can print the board images out on large poster paper and not have to worry about a lot of the measuring. I created an SVG board that would fit on 18x24 paper, edited the SVG and changed it to a TIFF image, and created images for the back as well. 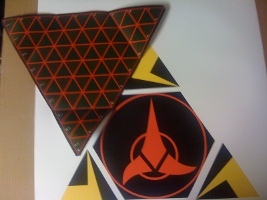 These are the images for the front and back of the board. 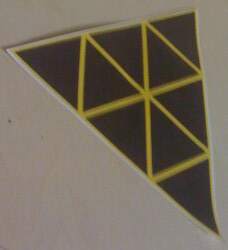 The three points surrounding the back image are for the board points that will fold up for storage and transport. 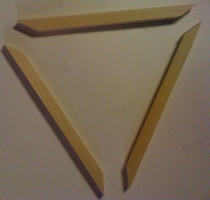 I used the images to measure the size of the triangle, and cut three sticks with angles at each end (30 degrees) so they could be glued together to make an original for making a mold from. These are glued together to make the frame for the board. We'll need nine of them. 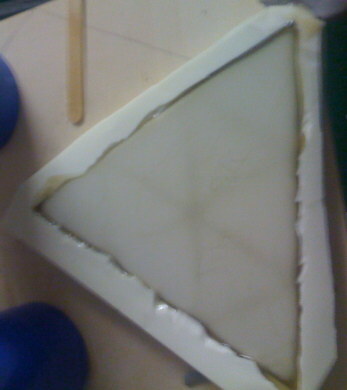 The top and bottom of the silicon mold I made. 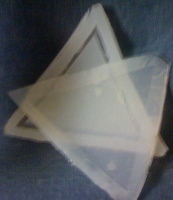 Cast a couple of triangles, they need to be trimmed and checked for fit. Once I have them, I'm ready to go. 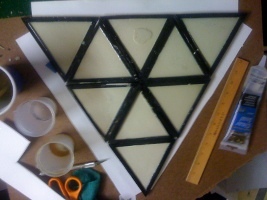 I have painted these black to make them show up in the final picture, but that isn't actually necessary at this time; the only portion that will be visible once the board is attatched is the edges that are at the perimiter of the triangles and hexagon. 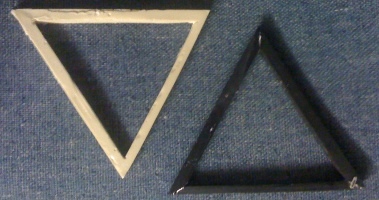 The left triangle has not been painted, this is the actual color of the resin I'm using. Companies make black resin, but it isn't as strong or easy to work with. After making seven more and painting them all, I'm ready to start assembly! Six need to be laid out on the centerframe. I'm using the back of the front of the board, as I plan to pour resin directly on the board once these have been glued down and there are no leaks to get resin outside of the frame. 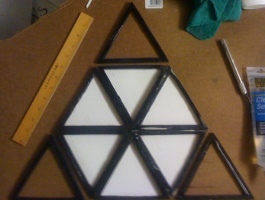 If I knew then what I know now, I would have made the center frame one piece instead of six joined triangles; it would make the board more solid. This is the back side of the center frame. The individual points have been folded over. 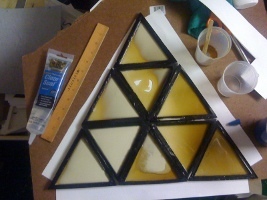 Filling the frames with resin. It is in direct contact with the front of the board (the white in the pictures) so the resin will make the board more solid. Board is filled and dry. The final step is joining the back images to the board. The center back can be solid black, it can have an image for playing other games, or it can be made just for looks (like here). I took the Goal SVG image and painted it red for the back image. The back of the board, image is just for looks. 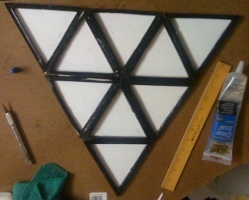 I'm pretty happy with the outcome (board pics will be uploaded once the pieces and spindles are made) except for an issue with sturdiness; the use of triangles for the center makes the board flex in ways I don't like; I'm making a second attempt with a solid hex center rather than the six triangles. I'll let you know how it comes out.